The following is a list of conference centers across Canada. Simply click on the name of the conference center to see a complete profile of each conference center including pictures, contact information, exhibit space details, and meeting room information. Event planners can sign up for a complimentary account after looking at conference center profiles and send an RFP (request for proposal) to a conference center in order to receive information on meeting/exhibit space pricing and availability. You can also search the Cvent Supplier Network to identify hotels, restaurants and special event venues near each conference center. Commonwealth Centre Calgary Calgary, AB 16,000 Sq. Ft.
Symphony Banquet Hall Mississauga Toronto, ON 7,000 Sq. Ft.
Annapolis Basin Conference Centre Cornwallis Park NS - Nova Scotia 40,000 Sq. Ft. Firefighters' Club Banquet & Conference Centre Burnaby Vancouver, BC 4,000 Sq. Ft.
Best Western Plus Leamington Hotel & Conference Center Leamington London, ON 5,000 Sq. Ft.
Royal Ambassador Event Centre Caledon Toronto, ON 16,000 Sq. Ft.
Sala San Marco Banquet & Conference Centre Ottawa Ottawa, ON 8,000 Sq. Ft.
Centre Mont-Royal Montreal Montreal, QC 50,000 Sq. 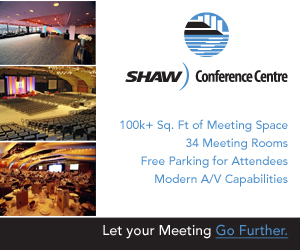 Ft.
MacEwan Conference & Event Centre Calgary Calgary, AB 40,000 Sq. Ft.
Grand Villa Casino Hotel & Conference Centre Burnaby Vancouver, BC 12,000 Sq. Ft.
Meridian Banquet & Conference Center Edmonton Edmonton, AB 10,000 Sq. Ft.
Anvil Centre New Westminster Vancouver, BC 25,000 Sq. Ft.
Metropolitan Conference Centre Calgary Calgary, AB 25,000 Sq. Ft. Le Jardin Conference & Event Centre Vaughan Toronto, ON 35,000 Sq. Ft.
Ivey Donald K. Johnson Centre - Toronto Toronto Toronto, ON 7,000 Sq. 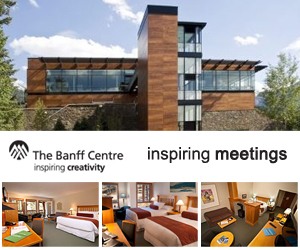 Ft.
Ghost River Crossing Conference Centre Cochrane Calgary, AB 2,000 Sq. Ft.
St. Lawrence College Conference Services Kingston Ottawa, ON 13,000 Sq. Ft.
SteelWorkers' Union Hall & Conference Center Sudbury Sudbury, ON 8,000 Sq. Ft.
Atrium Conference Centre Burlington Toronto, ON 6,000 Sq. Ft.
Harry Lumley Bayshore Community Centre Owen Sound London, ON 7,000 Sq. Ft.
Canada Olympic Park-Winsport Calgary Calgary, AB 20,000 Sq. Ft.
Harbour Banquet & Conference Centre & Compass Restaurant Oakville Toronto, ON 8,000 Sq. Ft.
St Elias Centre Banquet Hall & Conference Center Ottawa Ottawa, ON 11,000 Sq. Ft.
Victoria Conference Centre Victoria Victoria, BC > 100,000 Sq. Ft.
Tosca Banquet Hall & Conference Centre Oshawa Toronto, ON 14,000 Sq. Ft.
Centurion Conference & Event Center Ottawa Ottawa, ON 16,000 Sq. Ft.
Bingemans Conference Centre Kitchener London, ON 45,000 Sq. Ft.
Vancouver Island Conference Centre Nanaimo Victoria, BC 35,000 Sq. 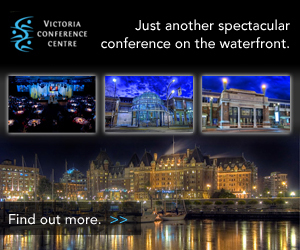 Ft.
Ambrosia Conference & Events Centre Victoria Victoria, BC 3,000 Sq. Ft. Le Parc Conference & Banquet Centre Concord Concord Toronto, ON 18,000 Sq. Ft.
Morris J. Wosk Centre for Dialogue Vancouver Vancouver, BC 17,000 Sq. Ft.
SFU's Meeting, Event & Conference Services at the Segal Building Vancouver Vancouver, BC 13,000 Sq. Ft.
Gelber Conference Centre Montreal Montreal, QC 9,000 Sq. Ft.
Avenue Art Gallery & Event Space Montreal Montreal, QC 2,000 Sq. Ft.
St. George Hall Waterloo London, ON 10,000 Sq. Ft.
Sawridge Inn & Conference Centre Peace River Peace River Edmonton, AB 4,000 Sq. Ft.
Oakville Conference & Banquet Center Oakville Toronto, ON 17,000 Sq. Ft.
Camp Fortune Aerial Experience Chelsea Montreal, QC 8,000 Sq. Ft.
Octaviens Banquet Hall & Conference Centre Oshawa Toronto, ON 8,000 Sq. Ft.
20 Toronto Conferences & Events Toronto Toronto, ON 20,000 Sq. Ft. The Brighton Convention & Event Center Toronto Toronto, ON 16,000 Sq. Ft. Chestnut Residence and Conference Centre, University of Toronto Toronto Toronto, ON 19,000 Sq. Ft.
Orchard View Conference Center Ottawa Ottawa, ON 20,000 Sq. Ft.
BMO Education & Conference Centre Toronto Toronto, ON 2,000 Sq. Ft.
Wu Conference Centre Fredericton NB - New Brunswick 13,000 Sq. Ft.
Quartier Tremblant – Base Camp Mont-Tremblant Montreal, QC 11,000 Sq. Ft.
Whistler Conference Centre Whistler Whistler, BC 40,000 Sq. Ft.
Tudor Hall Ottawa Ottawa, ON 12,000 Sq. Ft.
Kahanoff Conference Centre Calgary Calgary, AB 7,000 Sq. Ft.
Cerebral Palsy Association in Alberta Calgary Calgary, AB 2,000 Sq. Ft.
Paramount Conference & Event Venue Woodbridge Toronto, ON 60,000 Sq. Ft.
Northern Maverick Brewing Co. Toronto Ottawa, ON 7,000 Sq. Ft.
Riviera Parque Dining Banquet & Convention Centre Vaughan Toronto, ON 100,000 Sq. Ft.
Parksville Community & Conference Centre Parksville Victoria, BC 20,000 Sq. Ft.
BMO Institute for Learning Toronto Toronto, ON 30,000 Sq. Ft.
Edmonton EXPO Centre Edmonton Edmonton, AB > 100,000 Sq. Ft.
Ottawa Conference and Event Centre Ottawa Ottawa, ON 45,000 Sq. Ft.
Lincoln Alexander Centre Hamilton Toronto, ON 14,000 Sq. Ft.
McMaster Innovation Park Hamilton Toronto, ON 6,000 Sq. Ft.
Vantage Venues Toronto Toronto, ON 40,000 Sq. Ft.